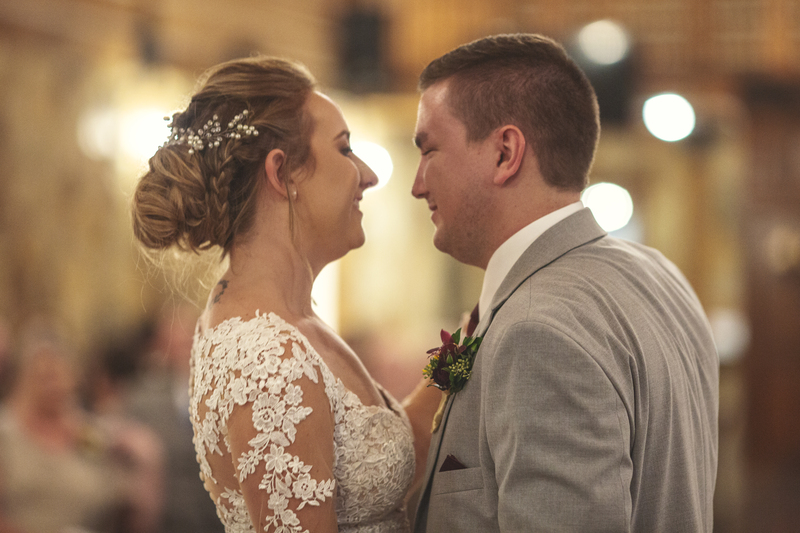 On November 16th, 2018, Drew and Chelsea were wed in holy matrimony inside a little country chapel at The Brooks Venue in Weatherford, Texas. Chelsea is a first-grade teacher while Drew works sales at Sellmark. The couple met through mutual friends during their time in College Station. As time went by and the couple grew closer Drew decided it was time to pop THE question. During Easter Sunday just after the Easter Egg Hunt Drew procured an Easter egg with something other than chocolate. To Chelsea’s surprise inside of the little egg, laid a ring. Before God and all her loved ones he proposed. The ceremony was absolute perfection. Each detail carefully made and placed to be tied all together to create a matrimonial masterpiece. The bridesmaids were enveloped by smooth emerald fabric whilst the groomsmen sported fitted ash colored suits and a pop of green from their ties. The bride in all her glory wore an off the shoulder lace wedding dress. The intricate laced design trailed her arm in ivy like fashion, her onyx colored hair pinned back in an elegant updo, ringlets softly framing her face. Her veil flowed behind her like a narrow heavenly stream. She was in every way beautiful. The groom looked so handsome in his grey suit and emerald tie. His hair combed neatly to the side, no doubt exuding a dapper presence. The reception was as lively as it was gorgeous. The whole room glowed with love and adoration for the new couple. The guests glided across the room to the music, laughter roaring from every corner. The night was an absolute treat for anyone who had a camera for sure. Skys the Limit Production would like to thank you for choosing us! We are truly honored to have been able to have captured your very special day through video. We wish you both nothing, but love and happiness. Megan and Evan met in the spring of 2013. Something is to be said about springtime. Birds singing songs of love, the busy bugs buzzing in unison like a dull roar. The sunny weather shining down on Earth and all the creations inhabiting it, heady scent flowers and crisp scent of grass filling the senses. No doubt the combination of this and steady eye for one girl, in particular, made for a novel like romance. Megan was working in Victoria’s Secret when Evan happened to come across her. You hear stories all the time about true love and how one will know, well, this surely was the case. December 2016, during their annual date, to celebrate their half anniversary at the Gaylord Texan, Evan proposed. The twinkling of the Christmas lights in the background and the beauty of everything around them preserved them at that moment, something to kindle the heart no matter how old. 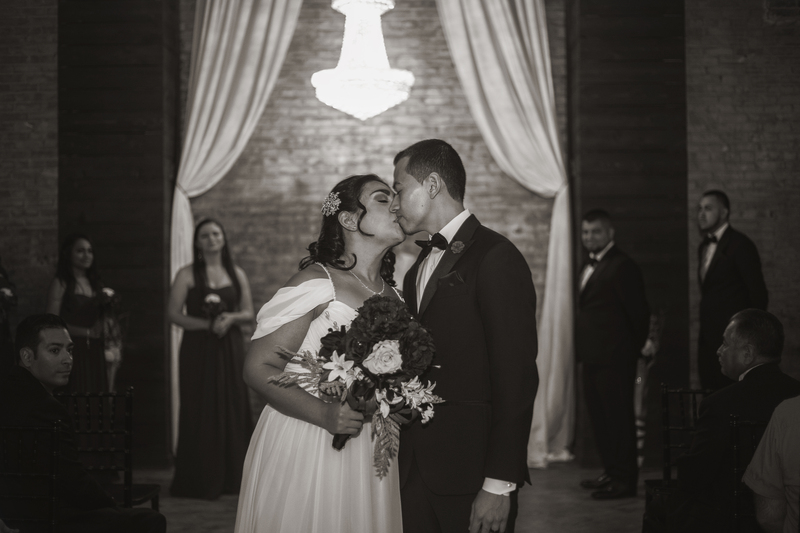 October 19, 2018, Megan and Evan were wed at the Spring Events Venue in Aubrey, Texas. Megan was a beauty to behold, her golden hair was pinned and braided in a vintage up-do, her train, flowing behind her like the autumn breeze as intricate lace embroidery catches the eye. Evan’s hair was smoothed to the side, the clean cut-ness of his suit made him look sharp and in every way a gentleman. The ceremony between these two lovers was as magical as the first time I did a wedding. Skys the Limit Production would like to thank you both for choosing us to capture your day through both video and photography! We are so honored and blessed to have been able to have been a part of your special day! Any couples needing photography help? Skys the Limit Production is having a photo mini session for those tying the knot. 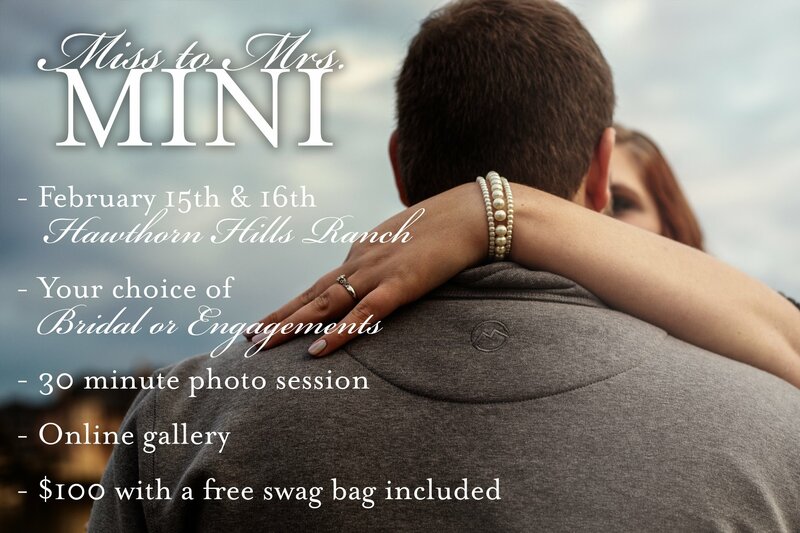 The event is held February 15th and 16th at the Hawthorn Hills Ranch in Krum, Texas starting at 9:00 a.m. You have two different session to choose from; Bridal or Engagements. Each session is around 30 minutes and comes with an online gallery of your edited photos. We have a great team that is ready to provide their talents in creating an outstanding, high quality, fun mini session. Daydream Events by Jess will be there to organize, direct and help with any needs. Bimini Sweets Bakery is providing sweet treats that are both delicious and beautiful to enjoy. Of course, we have Stem and Style bringing flowers and greenery. At the end of the session, you’ll receive a swag bag with nice little gifts from some of the best vendors around. If you would like to have your photos taken, please book through here. For any questions or concerns please email us at skysthelimit.videophotography@gmail.com. Happy New Year – we are currently in engagement season! In fact, according to WeddingWire, New Years Day is one of the top 10 most popular days to get engaged. This means, ladies, if your man left you a nice shiny rock on your finger during the holidays, maybe you can leave him a little something for the big day? This wallet is the perfect gift for your soon to be husband or even a thoughtful thank you for your groomsmen! Each wallet is perfectly personalized by the engraving of the recipient’s name delicately onto the wooden case it comes in as well as the wallet. The smooth cool leather makes for a sleek sophisticated look for any occasion. No need to worry if a billfold is not what your man desires. Groovy Guy Gifts has a large selection of personalized items to fit your prince charming’s personality like cufflinks, flasks, blades and more. This company shipped my billfold in quickly and the quality was like no other. They strive to make each experience intimate, original, and ever-lasting. So for any wedding, Groovy Guy Gifts is a must! Visit other great gifts here. And let’s not forget the ladies! If you’re looking for unique bridesmaid gifts, take a look at Bridesmaid Gifts Boutique.